This listing presented by Rod Stephanchew. Contact Rod by phone: 204-255-4204 or email direct here. S/S Now, OH Sat June 16th 1:00-3:00pm, OFFERS June 18th evening. 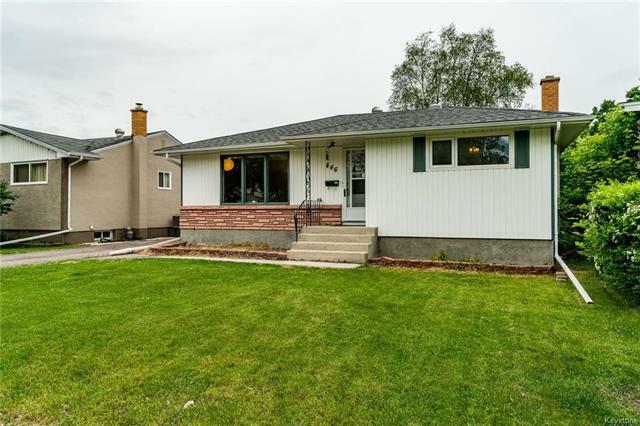 Sprawling bungalow, over 1,400 sq ft, room for the whole family on a 50' by 209' fully fenced park-like yard. Imagine the family picnics and gatherings you can host in your entertainment sized family home that comes with it's own park sized yard. This well cared for two owner home is original in many ways, however many updates have been done over the years to the big ticket items like furnace, eHWT, shingles, windows, vinyl siding, deck, bathrooms, soffits, facia, eaves,... This home features 3 main floor bedrooms, 2 full baths, hardwood floors, a large kitchen, formal dining room, a family room with wood burning fireplace, secluded deck, and a retro basement. There is storage galore, and all appliances are included. It is priced to sell, well below City Assessment. This is a great home in a great location offering tremendous space and privacy, with all the big city conveniences. Book your private showing today.